Sony A7 II: 15mm, f/2, 1/500s, ISO 6400. This image has been modified. Click for full-size image. Click here for the RAW file. The Laowa 15mm f/2 FE Zero-D lens is the fastest 15mm prime in its class. While it doesn't quite live up to its "zero distortion" billing, it comes mighty close for a full-frame 15mm lens. Not only is it distinct in its speed and optical design, but the lens also offers great build quality and a very close working distance, making it quite versatile for an ultra-wide angle prime lens. Let's take a closer look at this Laowa lens and see if it's next big thing for Sony E-mount shooters looking for a fast, wide prime. Note: The Laowa 15mm f/2 is a fully manual lens. I was routinely adjusting the aperture while shooting, and that number is not stored in the image exif data, so I have left the aperture information out of some image captions. If you want to see how the lens performs at each full stop of aperture, there are labelled test images in the gallery. The Laowa 15mm f/2 FE Zero-D lens feels sturdy and rugged. The lens weighs a surprising amount given its rather compact form factor and that is thanks to its metal design. The lens weighs just over a pound (500 grams) and is approximately 2.4 inches (62 millimeters) long with a maximum diameter of 3.2 inches (82 millimeters). While the lens itself feels rugged, the included removable lens hood is less robust. With that said, it's definitely better than the plastic lens hood that came with the 105mm Laowa lens I tested earlier this year. The lens cap is okay, but sometimes it doesn't snap in very easily within the lens' 72mm filter thread. I do want to give props to Laowa for allowing filters to be used with this lens as that makes it much more useful for landscapes than ultra-wide lenses without filter threads. As a manual focus lens, the focus ring is critical on the Laowa 15mm f/2 lens. Fortunately, it feels very nice and has a good ridged metal surface. The ring rotates with a proper amount of resistance, which makes precise focus adjustments easy -- granted, precise adjustments aren't as necessary when talking about a 15mm lens. The focus ring is engraved with a variety of distance markings in both meters and feet, which is a nice touch. The aperture ring is engraved and rotates well through its f/2 to f/22 range. You can switch between smooth and clicked rotation, too. I preferred the latter, but smooth rotation is helpful for video shooters. Ultimately, the build quality and design of the Laowa 15mm f/2 FE Zero-D lens is very nice. I wish that the lens hood and lens cap were a bit better, but other than that, I have no complaints. When considering the center of the frame, the Laowa 15mm f/2 is sharp right from f/2 onwards. It does get noticeably sharper at f/2.8, but I would not consider f/2 to be soft. At f/4, the lens resolves a lot of fine detail. At f/11, images get a fair bit softer and at f/16 and f/22, diffraction is readily apparent. I would consider central sharpness to be very good for this Laowa lens, especially from f/2.8 to f/8. Sony A7 II: 15mm, f/2, 1/1250s, ISO 100. Sharpness test image. This is a 100% central crop from a straight from the camera JPEG image captured at f/2. Click for full-size image. Click here for the RAW file. Sony A7 II: 15mm, f/2.8, 1/1000s, ISO 100. Sharpness test image. This is a 100% central crop from a straight from the camera JPEG image captured at f/2.8. The corners are not as sharp, but performance is still quite good. At f/2, the corners are noticeably soft, but at f/4 in particular, the performance across the frame is consistent and impressive. Corner performance improves a bit at f/5.6 and at f/8. It is not that the corners are soft when shooting wide open as much as there is a lack of overall contrast, which fortunately starts to improve from f/2.8. Sony A7 II: 15mm, f/2, 1/1600s, ISO 100. Sharpness test image. This is a 100% corner crop from a straight from the camera JPEG image captured at f/2. Sony A7 II: 15mm, f/5.6, 1/320s, ISO 100. Sharpness test image. This is a 100% corner crop from a straight from the camera JPEG image captured at f/5.6. Overall, the Laowa 15mm f/2 FE Zero-D lens is a sharp wide-angle prime on a full-frame camera. Corner sharpness is the only weakness, but it's far from bad in the corners. If you want to shoot landscape images, for example, stopping down to f/8 will offer great sharpness across the entire frame. It is not only corner sharpness you need to think about with the Laowa 15mm f/2, but also corner shading. There is considerable vignetting with the 15mm f/2 FE Zero-D lens. As you can see, it is quite dramatic when shooting wide open. This is not always a big problem, but I do find it distracting in certain real-world cases, such as when shooting astro shots (which will often be done at f/2 or perhaps f/2.8). In my opinion, this is where the Laowa 15mm f/2 performance is weakest. Sony A7 II: 15mm, f/2, 1/640s, ISO 100. Vignette test at f/2. Click for full-size image. Click here for the RAW file. Sony A7 II: 15mm, f/5.6, 1/125s, ISO 100. Vignette test at f/5.6. Click for full-size image. Click here for the RAW file. Chromatic aberrations and fringing are handled quite well by the Laowa 15mm f/2 FE Zero-D lens. There is some purple fringing issues in high-contrast situations, such as around leaves against a bright backdrop, for example, but it's not bad and longitudinal chromatic aberrations are not a problem at all. Sony A7 II: 15mm, f/8, 1/160s, ISO 100. Fringing test at f/8. Click for full-size image. Click here for the RAW file. As you can see, there is a small amount of false color in this test shot, but it's barely noticeable, even in this 100% crop. An aberration that is more relevant than usual due to this lens' potential as an astrophotography lens is comatic aberration. Basically, what matters here is the shape of stars in images, particularly in corners, when shooting wide open. It's not uncommon for a lens to turn stars into multi-pointed bright shapes rather than being nearly (or ideally totally) circular. In the case of the Laowa, coma is present in the extreme corners but I don't think its performance is significantly worse than other fast, wide lenses I've used. You can see an example of it below. Sony A7 II: 15mm, f/2, 20s, ISO 2000. In this 100% corner crop we can see some comatic aberration. It is typical to see some of this with any fast wide-angle lens. It is worth considering if you intend to use the Laowa 15mm f/2 lens for astrophotography. I would not consider this to be a deal-breaker as this issue is fairly common for a lens of this type. It can be addressed partially by stopping down or by cropping the extreme corners from the image. It's only really noticeable when viewing images near or at 100%. While the lens is referred to as a "Zero-D" lens, which is short for Zero Distortion, there is some visible distortion nonetheless. This is not surprising given its 110° field of view and considering the lens' focal length. Its distortion performance is admirable despite not being truly zero. Sony A7 II: 15mm, f/2, 1/500s, ISO 100. While there is some slight pincushion distortion, and I mean very slight, the lens keeps most lines remarkably straight. Notice the bottom corners and how straight the straight lines stay. The same is true for the bench near the center of the frame and the tree along the right edge. Impressive performance! With a close focus distance of 5.9 inches (15 centimeters), the Laowa 15mm f/2 Zero-D lets you get very close to your subject. The maximum magnification is 1:4, which while a far cry from the 1:1 15mm macro lens Laowa offers, is still quite impressive for a wide-angle prime, particularly one with an f/2 maximum aperture. Sony A7 II: 15mm, f/2, 1/100s, ISO 100. Close focus test image. Click for full-size image. Click here for the RAW file. The Laowa 15mm f/2 may not be able to match its 15mm macro sibling, but this Laowa can focus very close. The sharpness falloff in the corners when working at or near the close focus distance is dramatic, however, as you can see in this test image. Sony A7 II: 15mm, 1/500s, ISO 125. 100% crop of the image above. Click for full-size image. Click here for the RAW file. Sony A7 II: 15mm, f/2, 20s, ISO 1250. The Laowa 15mm f/2 works well for night photography. The fast maximum aperture makes it easier to focus as well. It would be nice if the exposure falloff was less significant in the corners though. Sony A7 II: 15mm, f/2, 6s, ISO 400. You can see a small bit of lens flare in the bottom right corner. The sun was just out of the top left corner of the frame. The included lens hood does a good job of combating lens flare overall. Sony A7 II: 15mm, f/5.6, 1/500s, ISO 160. Sony A7 II: 15mm, f/5.6, 1/15s, ISO 100. Overall, the Laowa 15mm f/2 FE Zero-D lens is a great option for landscape and night photographers using Sony E-mount cameras. The lens has very good build quality and if you don't mind it being a manual lens, then you should be quite pleased with how it handles in the field. The optical performance is generally good, in some cases very good, and there are not many weaknesses to be found here. Considering its price and good performance, the Laowa 15mm f/2 FE Zero-D is a very solid addition to Laowa's distinct and impressive lens lineup. Venus Optics, the camera lens manufacturer who had previously launched a number of unique Laowa camera lenses, is proud to announce the world's widest rectilinear f/2 native lens for Sony Full Frame E-mount cameras, the Laowa 15mm f/2 FE Zero-D. 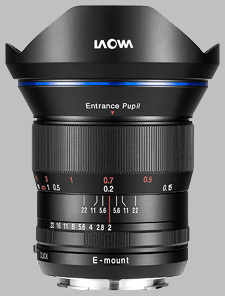 The Laowa 15mm f/2 FE Zero-D is currently the widest f/2 rectilinear lens on the market which comes with a native E mount (i.e. it does not require additional adapters). It is an ultra-wide & ultra-fast prime lens which covers both 35mm full-frame & APS-C sensors. Despite the extreme specifications, Venus Optics has successfully minimized the weight of the lens to around 500g (~1.1 pounds) and length to 8cm (~3.2 inches). This compact and lightweight lens is comprised of 12 elements in 9 groups with 2 aspherical elements and 3 Extra-low dispersion elements. The patented optical design successfully minimizes distortion and chromatic aberrations to their lowest but at the same time, delivers a superb optical performance from corner to corner. Ultra-wide & fast lenses on the market tend to be huge and have a dome-shaped front element. It is a headache for landscape photographers who need to use filters very often. Venus Optics understands their needs and managed to design a flat front surface and include a 72mm filter thread into the lens. 72mm screw-on filters can be used and no more investment in bulky filter holders is required. The extreme 110° angle of view and ultra-fast f/2 aperture allow photographers to create impressive astrophotography shots with ease. It also gives photographers a fast and wide-angle option for landscape photography and low-light shooting. The Laowa 15mm f/2 FE Zero-D is the second member of the Close-to-Zero distortion line-up from Venus Optics, following the launch of 12mm f/2.8 Zero-D last year. The lens is specially designed to remove the optical distortion that commonly exists in wide angle lenses at infinity focus. Any straight lines will be retained. Photographers can take advantage of the super close focusing distance (i.e. 15cm) and the f/2 aperture to create some pleasing bokeh shots and wide angle close-up shots. The Laowa 15mm f/2 FE Zero-D is currently available to pre-order in the official website of Venus Optics (http://www.venuslens.net/) and their authorized resellers. Recommended Retail Price in the US (without tax) is US$849. Pricing may vary in different countries. Shipping will start in late Aug/early Sept. The Laowa 15mm f/2 FE Zero-D doesn't have any user reviews yet!